Unsurprisingly, 82% of readers felt that $433 was a truly righteous price for a ready-to-go LeMons-winning BMW 535i. However, we can't stop thinking about Fiat, so that means we're going to look at one now. Nice Price Or Crack Pipe: Turnkey, Race-Ready, 24 Hours Of LeMons-Winning BMW 535i For $433? While Fiat never has had a powerful North American presence, some of their cooler machines have made it to these shores. The 124 Sport Coupe, for example, the 130, and- it goes without saying- the 8V. You've got to add the Fiat Dino to that list as well; easily confused with Ferrari's Dino, the Fiat Dino had a Ferrari V6 but was otherwise all Fiat (and Pininfarina or Bertone, depending on whether you got the convertible or the coupe version). They're seriously rare, but we've found a pretty nice one in Los Angeles. You want it, of course- just look at it!- but do you think 15 grand is a good price for it? PCH, Slot Car Handling On A Budget Edition: Turbo V6 Lotus Esprit or Fiat 124 Sport Coupe? 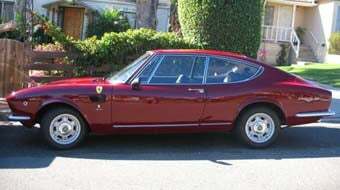 15 grand for a clean Fiat Dino?